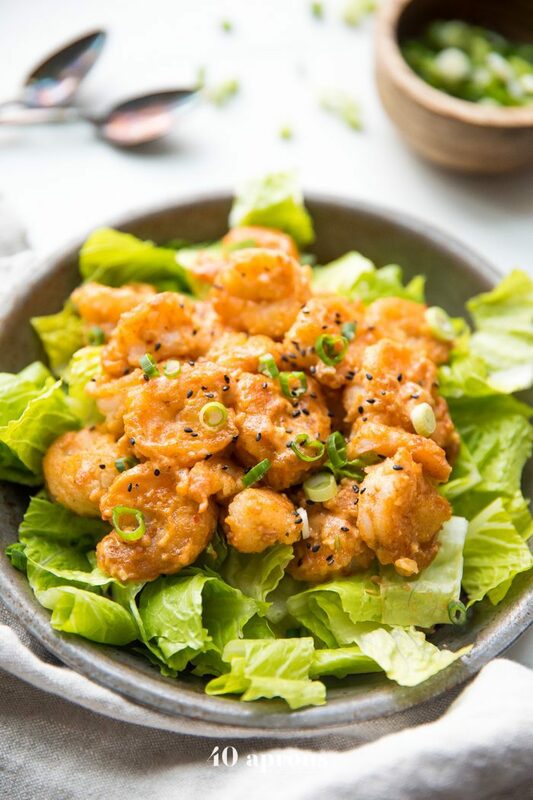 These Whole30 bang bang shrimp are crispy, tender, spicy, and creamy! They make a fantastic Whole30 dinner recipe and are paleo, gluten-free, grain-free, refined-sugar-free, and nut-free. Tossed in a sriracha-spiked creamy sauce, these Whole30 bang bang shrimp are seriously good! A perfect Whole30 dinner recipe for company, too. Perfect made with my Whole30 sriracha recipe, Whole30 ketchup recipe, and Whole30 immersion blender mayonnaise recipe. Let’s play a quick game of Never Have I Ever. I’ll start. Never have I ever… won a game of Never Have I Ever. Never have I ever watched the American Office. (I know. Don’t even try to convince me. It ain’t gonna happen. #Gervais4life). Never have I ever gone to Bonefish Grill and not ordered bang bang shrimp. Anyone drinking? Anyone at all? No? Didn’t think so. It’s not difficult to understand why we’d all love crispy shrimp tossed in a creamy, spicy sauce, is it? The shrimp are so tender, wrapped in a crunchy little hug, coated in a sauce that brings in all the goodness from life and leaves behind all the poo-pooness. Well, no. These Whole30 bang bang shrimp bring in all the goodness from life and leave behind all the poo-pooness. Because, of course, there’s all sorts of wacky weirdness in those bang bang shrimp that make them, eh, not the best choice when you’re trying to eat healthy, avoid vegetable oils, refined grains, sugars, and preservatives. But don’t you worry, sister! 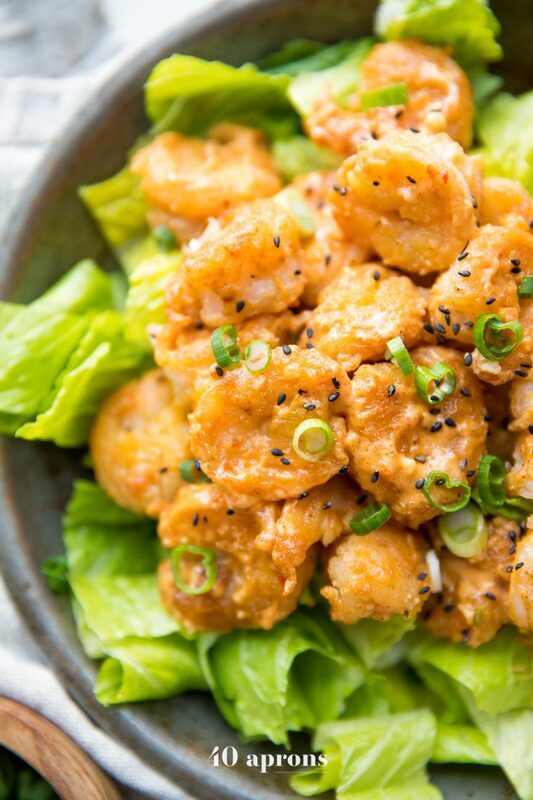 These Whole30 bang bang shrimp are here to rescue you. They’re dredged in an arrowroot and coconut flour mixture and pan-fried in your favorite oil then tossed in a homemade mayo + sriracha + coco aminos + ketchup mixture. Crispy, tender, spicy, creamy, perfection. 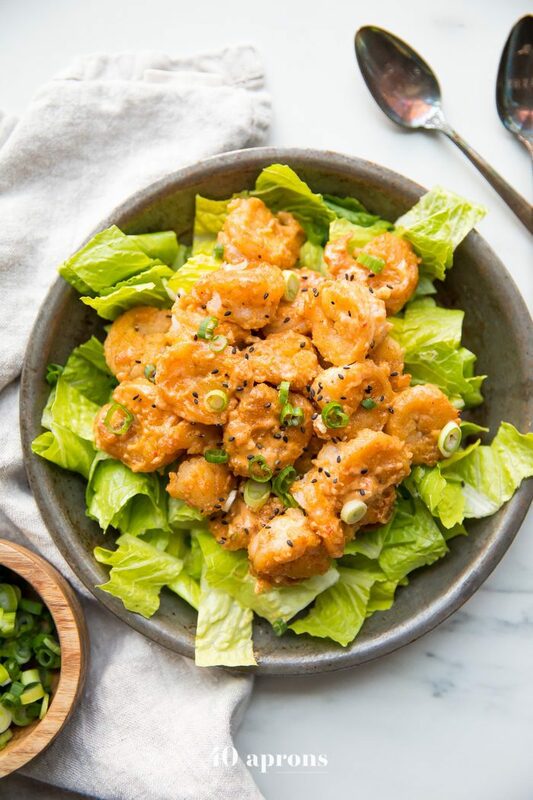 These Whole30 bang bang shrimp are, of course, paleo, gluten-free, grain-free, refined-sugar-free, and even nut-free, making them perfect to serve to almost anyone you know, except, of course, the vegetarians and vegans. And this recipe takes full advantage of homemade condiments that are super easy to prepare but that make all the difference in flavorful recipes. Namely: my Whole30 sriracha recipe, my Whole30 ketchup recipe, and my Whole30 immersion blender mayonnaise recipe. I highly, highly, highly recommend you keep the Whole30 sriracha on hand, but if you don’t have any, can’t make it (Please try if you can! You’ll freak out, I promise), and are on a Whole30, compliant hot sauce will do in a pinch. I’d recommend a more pepper-forward hot sauce in this case, like Cholula, rather than a more vinegar-forward hot sauce like Tabasco or Frank’s Red Hot. And make sure that when you dredge your shrimp, you ensure there’s no excess clinging on – you want just the coating on the shrimp to form a light and crispy shell around your crustaceans. A clumpy dredge will result in ultimately soggy shrimp – not what you want here! 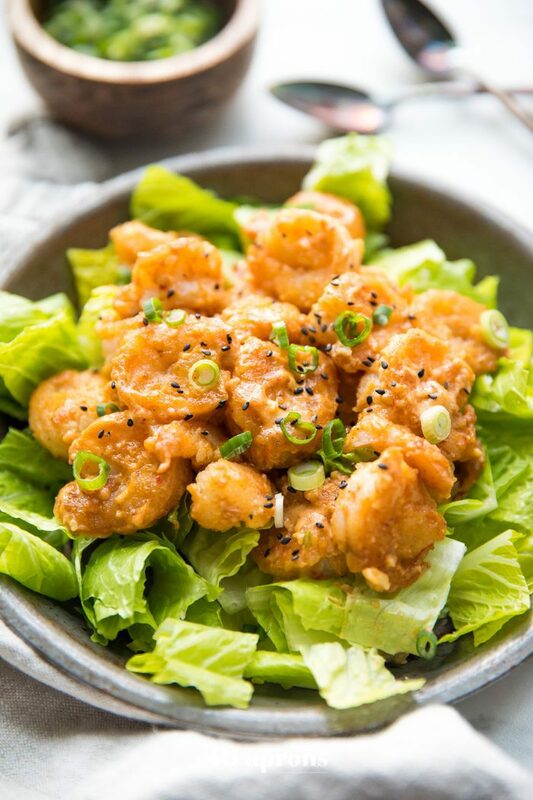 These Whole30 bang bang shrimp are crispy, tender, spicy, and creamy! They make a fantastic Whole30 dinner recipe and are paleo, gluten-free, grain-free, refined-sugar-free, and nut-free. 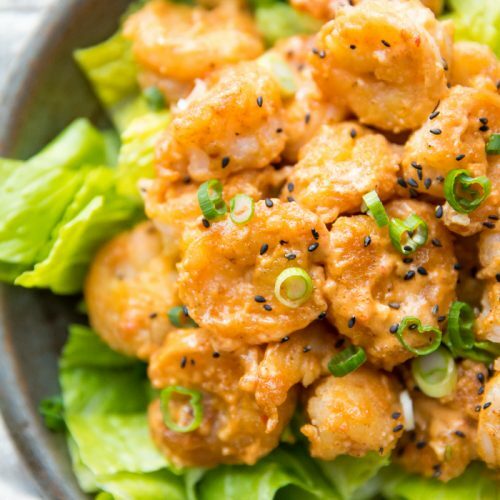 Tossed in a sriracha-spiked creamy sauce, these Whole30 bang bang shrimp are seriously good! A perfect Whole30 dinner recipe for company, too. Stir together all sauce ingredients and set aside. Whisk together coconut flour, arrowroot powder, salt, and pepper in a wide bowl. Dip shrimp in eggs then dredge in flour. Shake off excess and place on a baking sheet or plate. Repeat with all shrimp. Heat a thin layer of oil in a large skillet over medium heat. Working in batches, fry shrimp, making sure not to crowd. Wait until the bottom side is nicely browned before flipping, then flip and cook through on the other side. Shrimp should be beautifully browned and crispy. Remove from skillet with a slotted spoon and repeat until all shrimp are fried. In a large bowl, toss shrimp with half of sauce. Add more sauce to taste and toss. Serve with remaining sauce (if you have any). Top with sliced green onions and sesame seeds. The link to my Whole30 ketchup recipe is here, and the link to my Whole30 immersion blender mayonnaise recipe is here.